At some point during the Division I state wrestling tournament, it was less about the matches and more about the math. 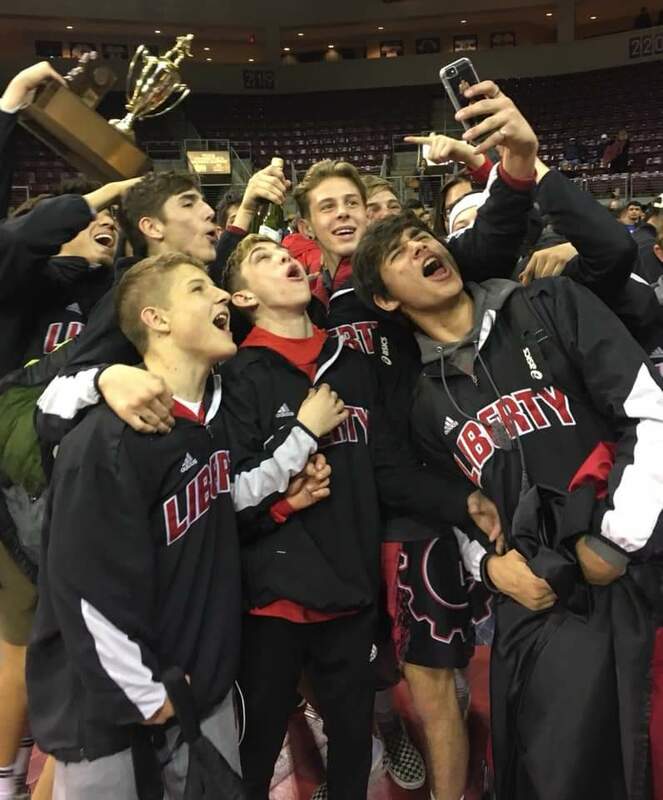 In its first state meet in the big school division, Liberty had all the numbers in its favor — 13 Lions wrestlers qualified for state and 11 of them placed in the top six. It was more than enough to lift the trophy. Even without a No. 1. Liberty cruised to its second team state championship Feb. 8 with 181 points to runner-up Phoenix Desert Vista’s 158. And they did it without a single state champion in his weight class. The Lions sported three second-place finishers. And — here’s a scary sentence for their opponents — none are even halfway through high school yet. Freshmen Zander Phaturos and Carson Coy were the runners-up at 106 and 113 pounds, respectively, while sophomore Collin McCorkle was second at 145 pounds. “We kind of knew we were going to dominate. All we had to do was our job to take care of the team race,” McCorkle said. Indeed, the three Lions in second were joined by three more in third place. Juniors Kamyn Stonebraker and Matthew Stevenson finished third at 152 and 170 pounds. Another freshman, Jonathan Rodgers, was third in the 120-pound class. While Phaturos and Coy were top varsity wrestlers from the start of their career, Brenton and Stonebraker said Rodgers improved the most of any Liberty wrestler during the course of the season. “Jonathan Rodgers did very well,” Stonebraker said. “He stepped up at the right time.”A fourth freshman, Tyler Sauter, earned fifth place at 126 pounds.While the Lions had a solid crop of returning wrestlers, the fab four frosh put this team over the top. “From preseason we had high expectations. We expected nothing but the best out of people. Going into state, we were prepared. Those incoming freshman having practiced for several years, we knew we had the right team,” Stevenson said. Several upperclassmen matured into state placers. Junior 160 pounder Gage Beaton placed sixth in his first chance at varsity. Junior Edgar Delgado matured into a sixth place at 138 pounds. And junior Andrew Correa moved from sixth at 126 pounds in Division II last year to fifth at 132 pounds this season. The work done on the first day set Liberty up for an relaxed second day. The team needed four wins going into the consolation semifinals to secure the title. The trophy was theirs by the time three weight classes finished. “I remember watching Jonathon Rodgers’ match. As he was scoring in the last few seconds, me and Collin looked at each other and just hugged each other and started celebrating,” Correa said. It was not nearly as dramatic as Liberty’s first state title — the Division II crown in 2016. But it was more satisfying in a sense, as this title is a testament to the program’s depth and development. In 2016 the Lions’ title was a squeaker over Chandler Seton Catholic determined by a single finals match. Miles Nuessle defeated the Sentinels’ Bridger Barker. Notice there has been no mention of seniors to this point. Only two of the Liberty wrestlers to qualify were seniors. And only Luke Pauga placed, sixth at 195 pounds. That results in a young team looking forward to a 2019-20 season in which the starting goal is another state title. Brenton said the biggest challenge for coaches and main charge for the wrestlers will be to battle complacency. “We know that next year we can win another state championship. 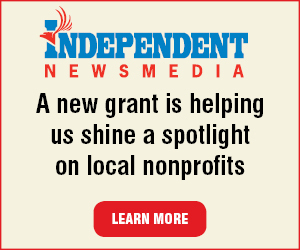 But we have to work for it,” Stevenson said. Correa said the Lions have enough good wrestlers that did not wrestle at state that the competition for starting places will keep everyone sharp. After traveling to tournaments in Las Vegas, Southern California and Utah this year, the goal, McCorkle said, is to start winning out of state tournaments. If they do that the Lions could be off to wrestling’s heartland.“Next year, we want to be going to Wisconsin or Minnesota,” McCorkle said. Brenton said an invite to tournaments like Doc Buchannan (aka Doc B) in Clovis, Calif., The Clash in Rochester, Minn. or The Cheesehad Invitation in Kaukauna, Wis., would elevate this program to its top level.